Ebola | America loves Sporks! Hmm. No headcover, no sealed Tyvek suit, no particulate filter for the mask (has to be HEPA) and it looks like a tear gas training session. Oh – and what in Heaven’s name are troops going to Africa for? Is there a school for dealing with infectious diseases that we need for fighting our enemies? But we have been told Ebola cannot be caught by airborn transmission. Yep, we have been told that Art. Are you referring to the way it is worn, per this regulation? Well, I learn something new every day! Now, imagine you are a follower of the Nation of Islam. What racial “message” does this picture project? Of course, the Army is color blind when it comes to race, but clearly most of the minority community isn’t. Answering Art’s Islamic “daily double” for 800 points: (1) The black soldier is wearing a protective mask because the current strain of Ebola is an engineered strain of virus developed by the U.S. (Thus only the U.S. has the secret antidote.) It attacks non-Caucasians by airborne transmission and casual contact, and it is much more lethal to blacks/olives once infected. Caucasians can only be infected by direct contact with contaminated fluids and they rarely die from it. 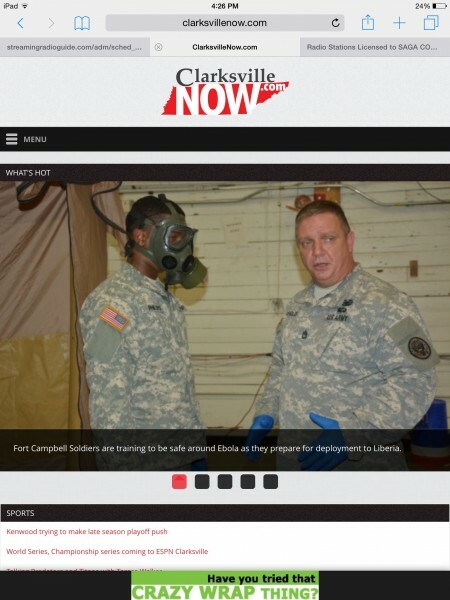 (2) The white soldier is a supervisor/trainer who will not be deploying to Liberia. Only lower-caste soldiers (i.e. non-whites) will be ordered to have direct contact with the infected populations. Of course none of the above is true, but truth and personal integrity have been missing from civilized society for many years now. Habitual public liars such as our president and his staff are never held accountable for the destruction they cause. Widespread distrust causes propaganda to be accepted as fact by the weak-minded. Or in biblical terms, when the flock rejects the shepherd’s rules it is all too easy for the wolves to obscure their true nature – until dinnertime.